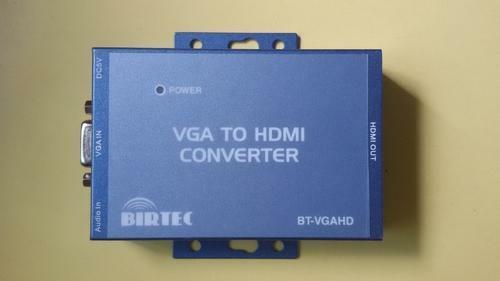 We have become the well-known trader, exporter and supplier of a high quality array of VGA to HDMI Converter. Offered range is designed using optimum quality components and sophisticated technology in synchronization with international standards at the vendor's end. In addition to this, our range is widely used in official, commercial and other various sectors. Apart from this, the entire range is examined under the inspection of quality controllers before delivery to ensure the premium quality. Industrial grade vga to hdmi convertor. Khyati Av Solution, established its operations in the year 2006, as a manufacturer trader and supplier of the finest and the most diverse range of Audio Visual and Networking Products. The offered range, highly acclaimed and asked for, is made up of the finest Audio Video VGA Cables, Projectors Screen and Audio Visual Product. Manufacturing of this range is done as per the set industry norms and guidelines, utilizing the finest raw materials and modern machines. This ensures the product’s standard of quality. Further, the offered range, for reasons of providing clients maximum satisfaction, is marked at the most reasonable rate possible and is delivered in the most punctual manner. Our highly advanced state-of-the-art infrastructural facility, laced with all the necessary machinery and equipment, help us in the attainment of several of the firm’s predefined goals and objectives. The facility, parted into a number of highly operational units, help us in the attainment of several of the firm’s predefined goals and objectives. For reasons of maximizing our reach in the market and boosting our productivity, the facility undergoes regular up-gradation. In addition to this, our highly ethical working habits have helped us generate a huge client base.